Best Cupcakes in the City! By GreenEyedLillies on May 29th, 2009 . Filed under: Bakeries, Photos . 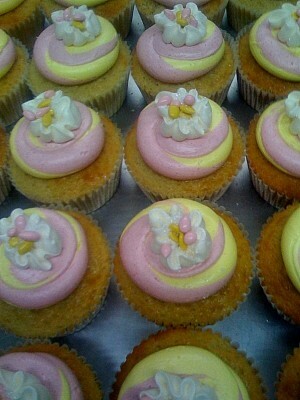 Hello, Cupcake Connoisseurs! I am one of the bakers at Swirlz Cupcakes in Chicago, and I have attached a couple of pictures showing the kinds of fun things we have been up to at our shop in the city. The first picture is of the raspberry lemonade cupcake that we made as a daily special in celebration (and anticipation) of hot summer days! We sold out of that flavor in about 3 hours! The second is a picture of one of our employees at Children’s Memorial Hospital in Chicago with some of their nurses. For nurses week, we are donating a bunch of our cupcakes every day to show our appreciation for everything they do. Everyone here really loves your website, and we’d love to be included in your blog! Thanks so much! Thank you for sharing this with us! Those cupcakes look amazing! Nurses rock! I would love to be a L & D Nurse someday! 2 Responses to Best Cupcakes in the City! Wow man, I never knew this, appreciated.